In late July 1984, Soviet authorities began a major, sustained crackdown on Hebrew teachers and other Jewish cultural activists. 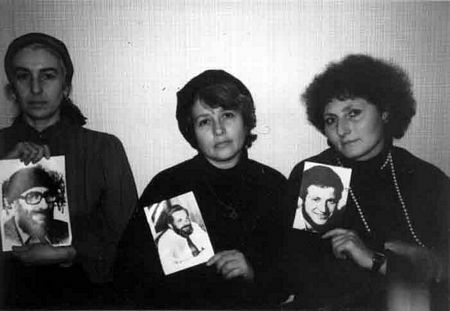 By the end of January 1985, eleven activists, including four Hebrew teachers, had been arrested and four sentenced to terms in Soviet labor camps. The arrests were accompanied by a series of searches, beatings, and threats which have sent shock waves through the Soviet Jewish community. The crackdown began with the July 26 arrest of Moscow Hebrew teacher Aleksandr Kholmianskiy in Estonia on hooliganism charges. Police reportedly located a pistol and ammunition in a subsequent search of his parents' Moscow apartment. In early September, his fellow Moscow Hebrew teacher, Yuliy Edelshtein, was arrested after a police search of his apartment turned up narcotics. There is no reason to doubt the assertions of close relatives that in both cases the items were planted by the police. On December 19, Edelshtein was convicted and sentenced to 3 years in a labor camp. Kholmianskiy, who is reportedly very weak after a prolonged hunger strike, is scheduled to come to trial on January 31 on the hooliganism and weapons possession charges. In addition to Moscow, the crackdown has focused on Jewish communities in the Ukraine. Yakov Levin, a Jewish cultural activist from Odessa arrested in early August, was sentenced on November 19 to 3 years in prison on charges of anti-Soviet slander. His alleged crime was circulating religious materials. His father-in-law to be, Mark Nepomnyashchiy, was arrested in October on anti-Soviet slander charges and is scheduled for trial on January 29. Their friend, refusenik Yakov Mesh, was also arrested in October on trumped-up charges of resisting arrest. The authorities released him and dropped charges against him in December after he sustained life-threatening injuries from a beating administered at the time of his arrest. Iosif Berenshtein, a Kiev Hebrew teacher, was arrested in November and sentenced to 3 years in a labor camp on December 10, also for allegedly resisting the police. Soon after his conviction, he was savagely beaten and stabbed. He suffered deep facial wounds, lost the sight of one eye, and is in danger of losing sight in his second eye. Two other Ukrainian Jewish activists, Leonid Schreier and Yakov Rosenberg, both from Chernovtsiy, were charged in late October with anti-Soviet slander. Schreier was sentenced to 3 years in a labor camp on January 3, while Rosenberg remains imprisoned awaiting trial. Leningrad, home of one of the largest and most active Jewish communities in the Soviet Union, has so far been spared major arrests. With the exception of Yakov Gorodetskiy, a leading activist who served a minor 2-month work release sentence in late summer, no one in the activist community has been arrested. The Leningrad community has not escaped major harassment, however. The phones of Gorodetskiy and several other activists have been disconnected, and more than 20 nonactivists refusenik families have been called in by the police and threatened with the loss of their jobs if they do not give up their plans to emigrate. There was also a local television program in November which identified several activists by name and accused them of engaging in "Zionist" subversion. Many local activists fear major arrests in the near future. One, Evgeniy Lein, has already been threatened with arrest on charges of "parasitism." The crackdown on Hebrew teachers and Jewish cultural activists has been accompanied by a stepped-up anti-Semitic campaign in the Soviet media. In addition to the Leningrad program cited above, a program aired in Moscow in November equated Zionism with Nazism and accused World War II Jewish leaders of helping the Nazis round up Jews for the death camps. The diversionary activities of the officially sponsored "Anti-Zionist Committee of Soviet Society" have also been given extensive coverage recently in the Soviet press. Following a December free from major arrests, the crackdown regained momentum in January. The arrest of Latvian Jewish cultural activist Vladimir Frankel in Riga January 15 had the effect of spreading the crackdown beyond Moscow and the Ukraine. Frankel was charged with anti-Soviet slander. In Moscow, meanwhile, prominent activist Dan Shapiro was arrested on January 22 and also charged with anti-Soviet slander. Police conducted numerous searches in conjunction with the two arrests and Moscow authorities are reportedly planning to arrest two more activists, Dmitriy Khazankin and Igor Kharach, who are colleagues of Shapiro's. The Department of State has been monitoring these disturbing developments with concern since the crackdown began in July. There can be no doubt that the campaign has been consciously directed by Soviet authorities to discredit and destroy the revival of Jewish culture in the Soviet Union. The methods used--arrests, beatings, the planting of evidence, and the use of the media to slander refusenik activists--have created a renewed atmosphere of crisis in the Soviet Jewish community and heightened international concern about what may next lie in store for Soviet Jewry. The U.S. Government deplores this accelerating campaign in the strongest possible terms, calls on the Soviet authorities to end it immediately, and urges them to live up to the commitments to respect individual human rights that they have solemnly undertaken in a whole series of international accords, from the Universal Declaration on Human Rights through the Helsinki Final Act and the concluding document agreed to in 1983 at Madrid. We will be watching with particular interest the results of the upcoming trials of Aleksandr Kholmianskiy and Mark Nepomnyashchiy.